One of the most common ways in which angels speak to us is by showing us repetitive number sequences. 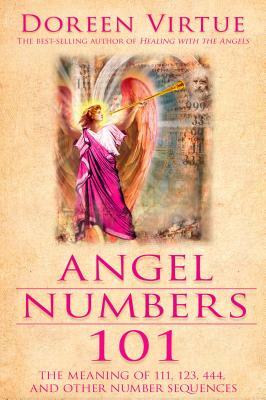 Since the publication of her best-selling book Angel Numbers, Doreen Virtue has received even more information from the angels about the meaning of number sequences such as 111, 444, 1234, and so forth.Angel Numbers 101 clearly explains how to receive accurate messages from your angels and heavenly loved ones whenever you see repetitive number sequences on telephone numbers, license plates, receipts, clocks, and such. Every message is completely updated for increased accuracy in understanding your angels’ messages.This handy reference guide is small enough to fit into a purse or desk drawer so you’ll always know what your angels are saying. Doreen Virtue is a best-selling author, a doctor of psychology, and a Christian who studies scripture. She has appeared on Oprah, CNN, the BBC, The View, and Good Morning America, and has been featured in newspapers and magazines worldwide. For information on Doreen’s work, please visit her at AngelTherapy.com or Facebook.com/DoreenVirtue444. To enroll in her video courses, please visit www.HayHouseU.com and www.EarthAngel.com.